Why did the Lutheran celebrate Lent? Just for the Halibut! Why did Mary and Joseph have Jesus in a barn? Because they wanted a "stable" lifestyle for their son. These are just a couple jokes you can tell as they are inaugurating you in front of a sea of Catholics. Whether you are a young pope or an old pope, you'll be the Pope-est with this Most-est when you go in this plus size Pope costume! Shake things up, maybe hire another artist to redo the Sistine Chapel in a more modern style. Graffiti style God and Adam, anyone? Sure, you might have to get used to a hectic schedule, but just think about how cool it will be to cruise around in cities all over the globe in your pope mobile. Of course, not everything is easy when you're traveling the world as the holiest of holies. Flying is tricky. You can't fly with more than three ounces of holy water with you and people are always asking you for holy water. You always end up running out halfway through the flight and believe it or not, no one else carries holy water with them and your main Cardinal is never willing to share his supply! You'll be looking cool (they always say that you look good in white!) and the crowds that gather to see you are going to get you pumped up to preach the holy gospel. 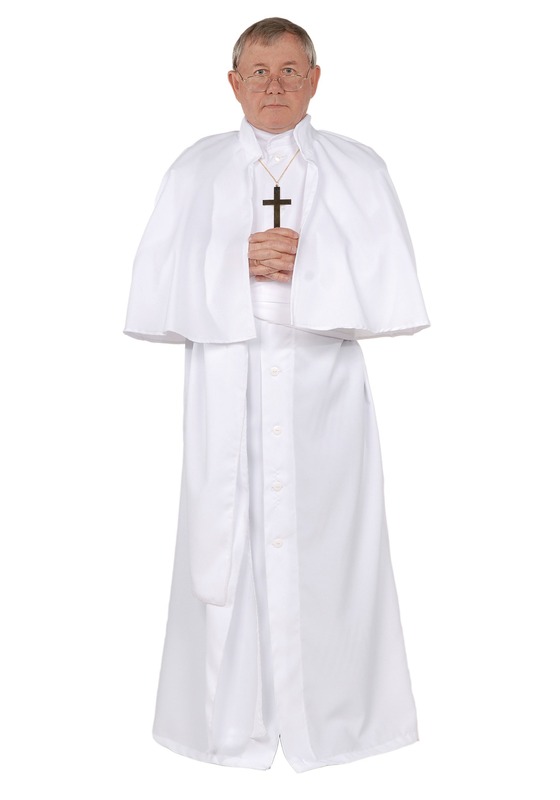 Take charge of the papacy with this floor length, lush Pope costume!